Ulysses Space Probe Looks At The Sun In Our Solar System. Ulysses probe is a joint mission by NASA and ESA to study the sun. Ulysses space probe is a robotic space probe designed to study the Sun at all latitudes. The Ulysses space probe is named for the Latin translation of "Odysseus", was launched in October 1990 from the Space Shuttle Discovery (mission STS-41) as a joint venture of NASA and the European Space Agency. The Ulysses space probe was originally scheduled for launch in 1986 aboard the Space Shuttle Challenger. The Ulysses space probe is equipped with instruments to characterize fields, particles, and dust, and is powered by a radioisotope thermoelectric generator (RTG). The Ulysses space probe mission is ongoing, still collecting valuable scientific readings to this day. Mission planning of the Ulysses space probe. By the middle of the space age, it was apparent that all our observations of the Sun focused on its equatorial regions and environs. The Earth, and all rockets launched from it, orbit in the ecliptic plane, which coincides with the Sun's equator. Moving directly to an orbit out of the ecliptic, however, would require an incredibly powerful and expensive vehicle. But several spacecraft (Mariner 10, Pioneer 11, and Voyagers 1 and 2) had successfully performed gravity assist maneuvers in the 1970s. If a spacecraft could swing by Jupiter, the planet's enormous gravity could alter the orbit to pass over the Sun's poles. An Out-Of-The-Ecliptic mission (OOE) was proposed. See article Pioneer H.
Originally, two spacecraft were to be built by NASA and ESA, as the International Solar Polar Mission. One would be sent over Jupiter, then under the Sun. The other would fly under Jupiter, then over the Sun. This would provide simultaneous coverage. Due to cutbacks, the US spacecraft was canceled in 1981. One spacecraft was designed, and the project recast as Ulysses, due to the indirect and untried flight path. NASA would provide the RTG and launch services, ESA would build the spacecraft, and the instruments would be split. The changes delayed launch from February 1983 to May 1986 where it was to be deployed by the Space Shuttle Challenger, however, the Challenger disaster pushed the date to October 1990. Launch of the Ulysses space probe. Ulysses was launched from a Space Shuttle, with a solid-fuel booster accelerating it to Jupiter. The booster consisted of a two-stage Boeing IUS (Inertial Upper Stage), plus a McDonnell Douglas PAM-S (Payload Assist Module-Special) on a 70 rpm spin table. On leaving Earth, the spacecraft became the fastest ever artificially-accelerated object; the New Horizons probe has since set the new record. Jupiter swing-by of the Ulysses space probe. Ulysses space probe arrived at Jupiter in February 1992 for a swing-by maneuver. This brought it out of the ecliptic plane by 80.2 degrees, in order to investigate the polar regions of the Sun. Ulysses space probe visits the solar northern polar regions. In 1994-95 it explored both the northern solar polar regions. Ulysses space probe: Comet Hyakutake. In 2000-01 it explored the southern solar polar regions, which gave many unexpected results. In particular the southern magnetic pole was found to be much more dynamic and without any fixed clear location. It is, of course, wrong to say that the Sun has no magnetic south pole. The Sun is not a magnetic monopole, the pole is merely more diffusely located than the north pole. Ulysses approached aphelion in 2003/2004 and made further distant observations of Jupiter. Extended mission of the Ulysses space probe. Ulysses' mission has been extended until at least March 2008, enabling it to continue operating while flying over the Sun's poles for the third time in 2007 and 2008. At some point, the craft's RTG will lose too much wattage. Not enough power will be on hand to operate science instruments, while keeping the Hydrazine fuel from freezing. Instrument power sharing has already begun. The most important instruments are always online, those of minor importance not. When the probe neares the sun, it's energy-demanding heaters are turned off, and all instruments are up and running. Results from the Ulysses space probe. During cruise phases, Ulysses is still providing unique data. 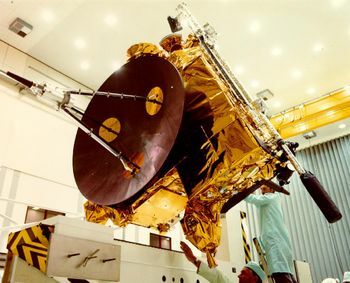 As the only spacecraft out of the ecliptic with a gamma-ray instrument, Ulysses provides an important part of the InterPlanetary Network (IPN). The IPN detects Gamma ray bursts (GRBs); since gamma rays cannot be focused with mirrors, it was very difficult to locate GRBs with enough accuracy to study them further. Instead, several spacecraft can locate the burst through triangulation (or, more specifically, multilateration). Each spacecraft has a gamma-ray detector, with readouts noted in tiny fractions of a second. By comparing the arrival times of gamma showers with the separations of the spacecraft, a location can be determined, for follow-up with other telescopes. Because gamma rays travel at the speed of light, wide separations are needed. Typically, a determination comes from comparing: one of several spacecraft orbiting the Earth, an inner-Solar-system probe (to Mars, Venus, or an asteroid), and Ulysses. When Ulysses crosses the ecliptic twice per orbit, many GRB determinations lose accuracy. The spacecraft body is roughly a box, approximately 10 × 11 × 7 feet in size (3 × 3.3 × 2 m). The box mounts the 1.65 meter dish antenna and the RTG power source. The box is divided into noisy and quiet sections. The noisy section abuts the RTG; the quiet section houses the instrument electronics. Particularly "loud" components, such as the preamps for the radio dipole, are mounted outside the structure entirely, and the box acts as a Faraday cage. Ulysses is spin-stabilized about the axis of the dish. The RTG, whip antennas, and instrument boom were placed to stabilize this axis. Spin is nominally 5 rpm. Inside the body is a Hydrazine fuel tank. Hydrazine monopropellant is used for course corrections, and to repoint the spin axis (and thus, the antenna) at Earth. The spacecraft is controlled by eight thrusters, in two blocks. Thrusters are pulsed in the time domain to perform rotation or translation. Four Sun sensors detect orientation. For fine attitude control, the S-band antenna feed can be tipped slightly off-axis. A signal from Earth then pulses with the 5 rpm spin. The pulsing is deconvolved into orientation, a method called CONSCAN. The spacecraft uses S-band for uplinked commands and downlinked telemetry, through dual redundant 5-watt transceivers. The spacecraft uses X-band for science return (downlink only), using dual 20W TWTAs. Both bands use the dish antenna; both are prime-focus feeds, unlike the Cassegrain feeds of most other spacecraft dishes. Dual tape recorders, each of approximately 45 megabit capacity, store science data between the nominal 8-hour communications sessions. During times of high DSN traffic, sessions are not long enough, and the instruments record at lower resolution. The spacecraft is designed to withstand both the heat of the inner Solar system, and the cold at Jupiter's distance. Cold is prevented by extensive blanketing and electric heaters. Heat is prevented primarily by slinging the spacecraft so that it never comes within 1.3 AU of the Sun, after initial launch. This means the mission studies the Sun from farther away than programs on or around the Earth. Ulysses space probe overall weight at launch is 370 kg (814 pounds). Instruments on the Ulysses space probe. Radio/Plasma antennas. Two beryllium-copper antennas unreel outwards from the body, perpendicular to the RTG and spin axis. Together this Dipole spans 72 meters. A third antenna, of hollow beryllium-copper, deploys from the body, along the spin axis opposite the dish. It is a monopole antenna, 7.5 meters long. These measure radio waves generated by plasma releases, or the plasma itself as it passes over the spacecraft. Experiment Boom. A third type of boom, shorter and much more rigid, extends from the last side of the spacecraft, opposite the RTG. This is a hollow carbon-fiber tube, of 50 mm diameter. It can be seen in the photo as the silver rod stowed alongside the body. It carries four types of instruments. A solid-state X-ray instrument is composed of two silicon detectors. It studies X-rays from Solar Flares and Jupiter's aurorae. The GRB experiment consists of two CsI scintillator crystals with photomultipliers. Two different magnetometers are mounted: a vector helium magnetometer and a fluxgate magnetometer. A two axis magnetic search coil antenna measures AC magnetic fields. Body-Mounted Instruments. Detectors for Electrons, ions, neutral gas, dust, and cosmic rays are mounted on the spacecraft body around the quiet section. Lastly, the radio communications link can be used to search for gravity waves (through Doppler shifts) and to probe the Sun's atmosphere through occultation. Ulysses space probe total instrument mass is 55 kg.